Christmas is here, time to be Merry and spread Joy! We all like to get into the Christmas spirit, be it by decorating the tree, lighting up the house or shopping for gifts. And to bring in some cheer to your workplace and everyday look, we thought of the simplest and most elegant way to style up – Nail arts! What are we waiting for? Let’s get started with our Christmas Nail art inspirations. Nope, you don’t need to draw an actual Santa on your nails. All you need is a base coat, a white and red nail polish and some rhinestone stickers. Start with the base coat and just make French manicure style stripes, alternating between the red and white shades. Yes, that simple! Now stick some rhinestone on a nail or two to add some Christmas sparkle on your minimalistic nail art. Everyone knows the legend of Rudolph, Santa’s Red-Nosed Reindeer who lights up the path with his bright red nose. Let’s get that luminosity on our nails with some dazzling red polish. 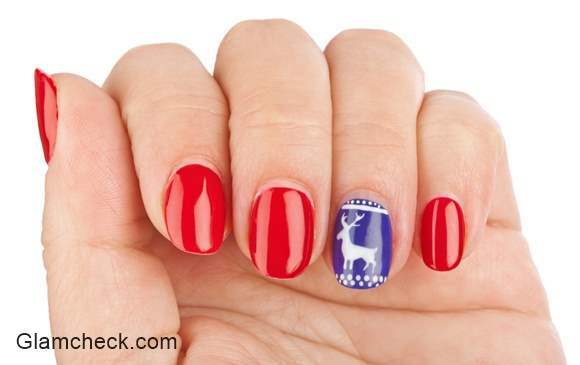 Now glue a reindeer nail art sticker on the ring finger. If you’re artsy, go ahead and paint a pretty reindeer. Blue is what is like, because the contrast captures more attention. Nothing announces Christmas like the fall of serene and beautiful snowflakes. Get them on your nails to bring on the spirit of the season. Paint your nails a pretty red because as they say, red and Christmas go hand in hand! Now draw some pretty snowflakes on the middle and ring fingers with a white paint. Add a tiny rhinestone and top with some glitters on one finger to keep it classy and subtle. Beautiful, don’t you think? Base coat, silver glitters, white, red and black nail paint is what you’ll need to get this cutesy Christmas nail art. 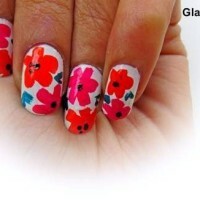 Apply the base coat and paint the tip with silver glitter polish like a French manicure but leave the ring finger empty. Draw a pretty Rudolph with his shiny nose on one ring finger and on the other, an adorable Frosty with his Christmas cap. How cute! What say, ready for Christmas fun with some striking nail arts?